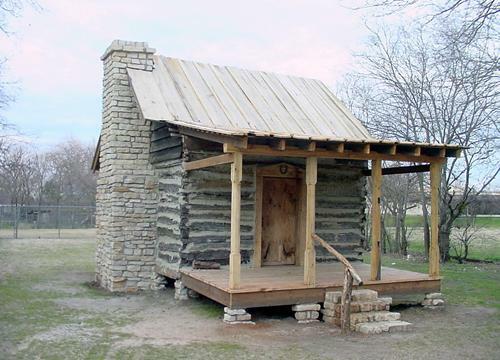 The Allen Cabin that has recently been moved to the grounds of the White Settlement Historical Museum. White Settlement dates to the 1850s, shortly after the establishment of Fort Worth (November 1849) and the creation of Tarrant County. The name comes from the fact that there were no Indians living in the immediate vicinity. At that time there were only one or two trading posts and scattered farms that extended across hostile territory from Fort Worth to the Parker County line. The road leading into Parker County was known as the White Settlement Road. An organized community developed around the homesteads of the three Farmer Brothers from Tennessee. John Farmer had his first cabin burned by hostile Indians. The Farmer Brothers were later joined by a fellow Tennesseean named Paul Isbell who provided a footnote in Texas history by playing a prominent role in the hanging of two men believed to be organizing a rebellion of slaves in 1860. Other settlers came from Kentucky in 1854 in a ten wagon 搕rain,� settling on the creek known as Farmer抯 Branch. After the Civil War the town remained a frontier outpost, but when the threat of Indian attack was removed, it grew. The town was granted a post office in 1866 which closed sometime in the 1870s. In the 1880s the town was bypassed by the railroads and growth remained slow until WWII when Carswell Air Force Base was built (1942) and nearby aircraft plants employeed thousands. White Settlement incorporated in 1950. 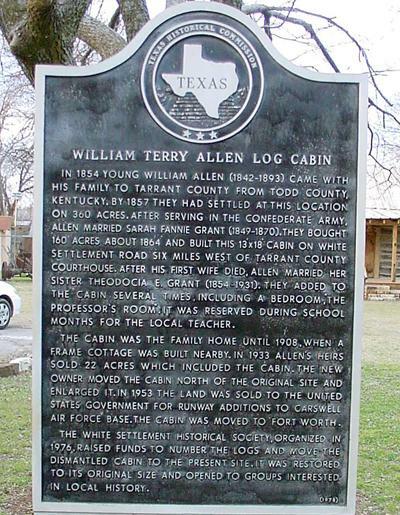 In 1854 young William Allen (1842-1893) came with his family to Tarrant County from Todd County, Kentucky. By 1857 they had settled at this location on 360 acres. After serving in the Confederate Army, Allen married Sarah Fannie Grant (1849-1870). They bought 160 acres about 1864 and built this 13' x18' cabin on White Settlement Road six miles west of Tarrant County Courthouse. After his first wife died, Allen married her sister Theodocia E. Grant (1854-1931). They added to the cabin several times, including a bedroom, "The Professor's Room". It was reserved during school months for the local teacher. The cabin was the family home until 1908, when a frame cottage was built nearby. In 1933 Allen's heirs sold 22 acres which included the cabin. The new owner moved the cabin north of the original site and enlarged it. In 1953 the land was sold to the United States government for runway additions to Carswell Air Force Base. The cabin was moved to Fort Worth. The White Settlement Historical Society, organized in 1976, raised funds to number the logs and move the dismantled cabin to the present site. It was restored to its original size and opened to groups interested in local history.